SUMO (small ubiquitin-related modifier), a member of the ubiquitin-like protein family, regulates diverse cellular functions of a variety of target proteins, including transcription, DNA repair, nucleocytoplasmic trafficking and chromosome segregation. SUMO precursor proteins undergo cleavage of the residues after the “GG” region by SUMO-specific proteases in maturation. This cleavage of the precursor is a prerequisite for subsequent sumoylation. 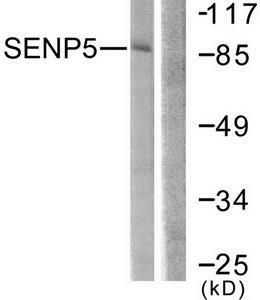 The sentrin-specific (or SUMO-specific) protease (SENP) proteins belong to the peptidase C48 family and include SENP1-3 and SENP5-8. SENP1, SENP2 and SENP3 degrade UBL1 and SMT3H2 conjugates and subsequently release the monomers from sumoylated substrates. HIPK2 is a desumoylation target for SENP1 which shuttles between the cytoplasm and the nucleus. Mutation analyses reveal that SENP1 contains the nuclear export sequence (NES) within the extreme carboxyl-terminal region, and SENP1 is exported to the cytoplasm in a NES-dependent manner. SENP2 has been implicated as a downregulator of CTNNB1 levels and may therefore be a modulator of the Wnt pathway. SUMO protease SENP3 reverses the sumoylation of MEF2 to augment its transcriptional and myogenic activities. SENP5 localizes to the nucleolus and preferentially processes SUMO-3. It is thought to play a role in mitosis and/or cytokinesis. SENP6 localizes to the cytoplasm and releases SUMO-1. Expression of SENP6 is higher in reproductive organs, indicating that it may mediate processes related to reproduction. SENP8 is involved in the release of sentrins. 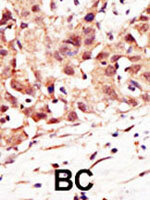 Immunohistochemistry (IHC) analyzes of SENP5 antibody (Cat.-No. : AP06459PU-N) in paraffin-embedded human lung carcinoma tissue. 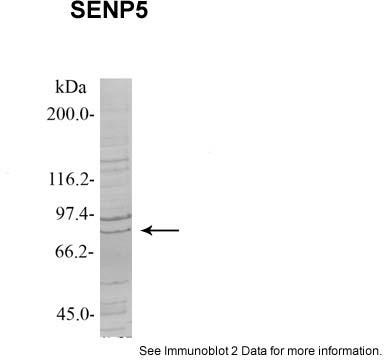 Western blot (WB) analysis of SENP5 antibody (Cat.-No. : AP06459PU-N) in extracts from PC12 cells. Formalin-fixed and paraffin-embedded human cancer tissue reacted with the SENP5 polyclonal antibody ( Cat # PAB2419 ) , which was peroxidase-conjugated to the secondary antibody, followed by DAB staining. This data demonstrates the use of this antibody for immunohistochemistry ; clinical relevance has not been evaluated. BC = breast carcinoma. 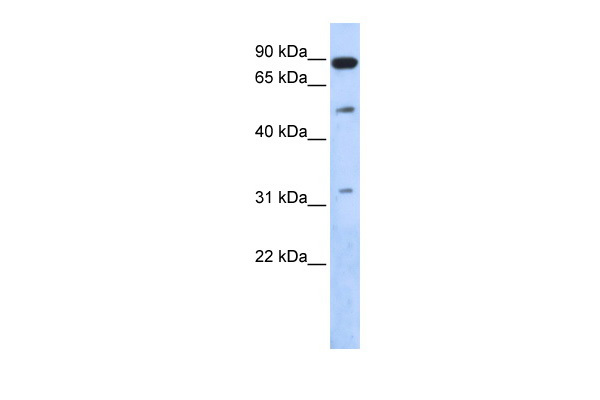 Western blot analysis of SENP5 polyclonal antibody ( Cat # PAB2419 ) in SAOS-2 cell lysate. 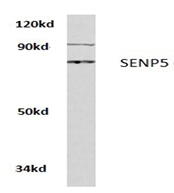 SENP5 ( Arrow ) was detected using purified polyclonal antibody. Secondary HRP-anti-rabbit was used for signal visualization with chemiluminescence. 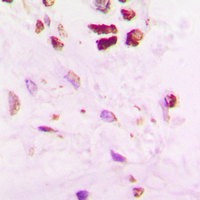 (LEFT) Formalin-fixed and paraffin-embedded human cancer tissue reacted with the primary antibody, which was peroxidase-conjugated to the secondary antibody, followed by DAB staining. This data demonstrates the use of this antibody for immunohistochemistry; clinical relevance has not been evaluated. 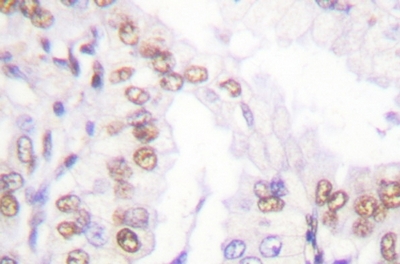 (RIGHT) Formalin-fixed and paraffin-embedded human lung carcinoma tissue reacted with SENP5 Antibody (C-term) (Cat.#AP11240PU-N), which was peroxidase-conjugated to the secondary antibody, followed by DAB staining. This data demonstrates the use of this antibody for immunohistochemistry; clinical relevance has not been evaluated. 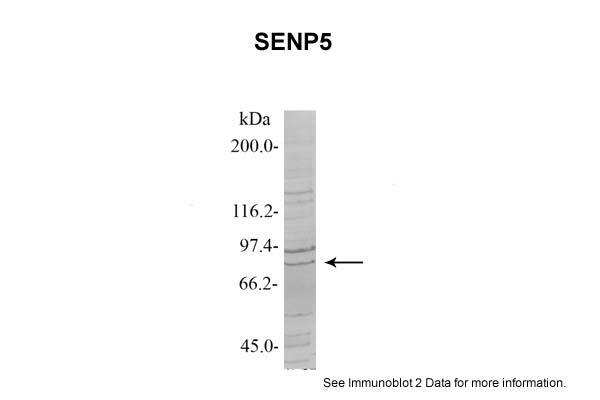 Western blot analysis of SENP5 polyclonal antibody (Cat. #AP11240PU-N) in Saos-2 cell lysate. SENP5 (Arrow) was detected using purified Pab. Secondary HRP-anti-rabbit was used for signal visualization with chemiluminescence. Western Blot analysis of SENP5 expression in transfected 293T cell line by SENP5 monoclonal antibody (M01), clone 3C2.Lane 1: SENP5 transfected lysate(86.7 KDa).Lane 2: Non-transfected lysate. Immunohistochemistry analysis of paraffin-embedded human lung carcinoma tissue, using SENP5 Antibody. The picture on the right is treated with the synthesized peptide. Western blot analysis of extracts from COS7 cells, using SENP5 Antibody. The lane on the right is treated with the synthesized peptide. Immunohistochemical analysis of SENP5 staining in human lung cancer formalin fixed paraffin embedded tissue section. The section was pre-treated using heat mediated antigen retrieval with sodium citrate buffer (pH 6.0). The section was then incubated with the antibody at room temperature and detected using an HRP conjugated compact polymer system. DAB was used as the chromogen. The section was then counterstained with haematoxylin and mounted with DPX. 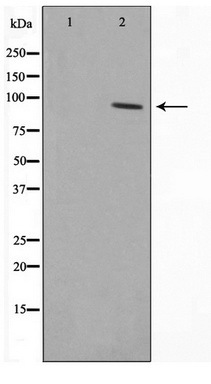 Western blot analysis of SENP5 expression in PC12 (A); Jurkat (B); NIH3T3 (C) whole cell lysates. Western blot analysis of extracts from COS7 cells, using SENP5 antibody.The lane on the right is treated with the synthesized peptide. 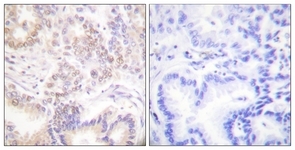 Immunohistochemistry analysis of paraffin-embedded human lung carcinoma tissue using SENP5 antibody.The picture on the right is treated with the synthesized peptide.